Can you think of some fabulous dog names that start with D? That’s what you need to do if you’re planning on getting a new puppy or welcoming a rescue dog into your life and you want his name to start with D.
In this article, we’ve included lots of great dog names that start with D.
We also give you some great advice on how to choose a name for your new puppy, particularly if you want a name that begins with D! When choosing a name for your puppy or rescue dog, always pick something short and easy to remember. Just imagine calling out a long, complicated name that takes forever to say. Your puppy won’t remember the name, and a long name will quickly be lost amid a sea of barking at the dog park! That said, if you find a dog name that starts with D that you absolutely adore but is rather long, you can still have it. All you need to do is shorten the name to make it into a nickname. That will make the name much easier for your pup to learn and remember. 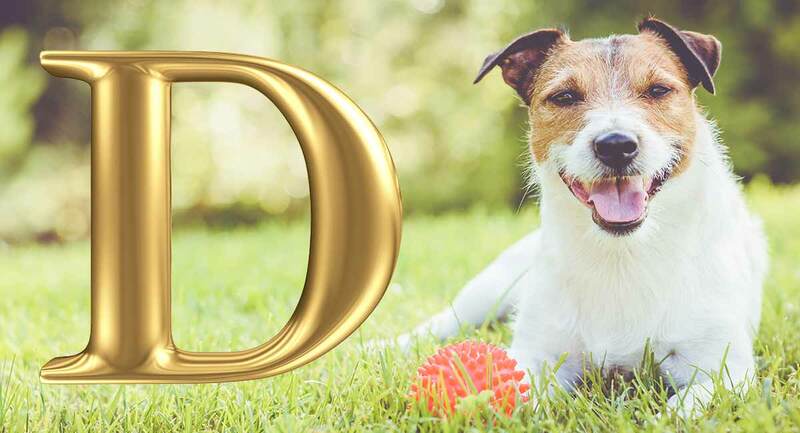 There are lots of totally cool dog names that start with D for you to choose from that might suit your pet. And we’re going to list some of them for you in this article. For more inspiration, get yourself a baby name book. Inside you’ll find hundreds of names beginning with D that might be perfect for your pup! Some of the best dog names that start with D are the simplest ones! There are plenty of female dog names that start with D.
The name you choose will depend on the type of dog you have and her personality. So if you have a tiny Chihuahua, you’ll want to pick something dainty. On the other hand, if you have a German Shepherd or a Cane Corso, you may decide that a noble name suits her best. Remember that some dog names that suit lady dogs can be unisex and will also suit boys! Check out this article for more inspiration! There are just as many male dog names that begin with D as there are female ones! The name you decide on for your male dog should reflect his personality and his look. That can be tricky to weigh up if you’re getting a puppy. You might know what your dog will look like when he gets older, but his personality will develop as he matures, so picking a name now is something of a guessing game! Some of the names in this section could be used for a girl or a boy. So if you really love a unisex name, go for it! Take a peek at this article to get some more ideas! Some dogs are just cool! And a cool dog needs a cool name to suit him! The article at this link has a whole bunch of cool dog names for you to choose from, many of them starting with D.
Some dogs are totally cute! Of course, if you have a cutesy pup, you’ll need a cutesy name to suit him or her. At this link, you’ll find a whole lot of cute dog names to suit your pretty pup! And in case that’s not enough, here are a few more ideas for you to kick around. Some dog owners like to pick a funny name for their pup. That’s a great idea if you have a sense of humor and enjoy a good laugh. But be careful not to pick a name that others may find offensive. You could take your inspiration from funny TV characters, comedians, or even figures from history. Remember too that what’s an in-joke today may not be in fashion in a few years. Be sure that you’re going to love the name you pick today just as much tomorrow when the joke’s not so fresh. He’s truly one of a kind! So he needs a unique name too! Unique dog names don’t just set your pup apart from everyone else’s pet. They help to ensure there’s no confusion at the dog park or in the vet’s clinic. You’ll find lots of unique dog name suggestions at this link. If your dog looks tough, you might want to choose a tough dog name that starts with D.
Here’s a whole chunk of tough dog names for you to consider. So you don’t want to pick this name if you want your dog to be unique! There are over 50 recognized dog breeds that begin with the letter D.
The most popular method of choosing a dog name beginning with D is to buy a baby name book and look through the appropriate section. Baby name books also give you the meaning and origins of each name, making it easy for you to find a name that really suits your pup. What name did you choose for him? We’d love to know, especially if it’s one of the names we’ve suggested in this article. Share your pup’s story in the comments section below with other readers and us!